Yes, there is a cat circus. And yes, the cat circus is coming to Pittsburgh. This is not the first time the Acro-Cats bus has rolled into Pittsburgh. From my social media research, it looks like the Acro-Cats tour has made stops in Pittsburgh in 2013 and 2015. There is a line around the block for the #CatCircus. 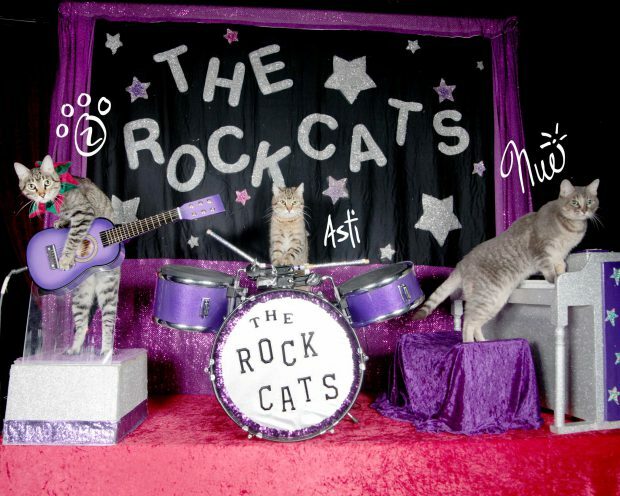 The final act of the Acro-Cats show is a performance by The Rock Cats. The world’s only all cat rock band. The cats travel in not one, but two custom cat vehicles. 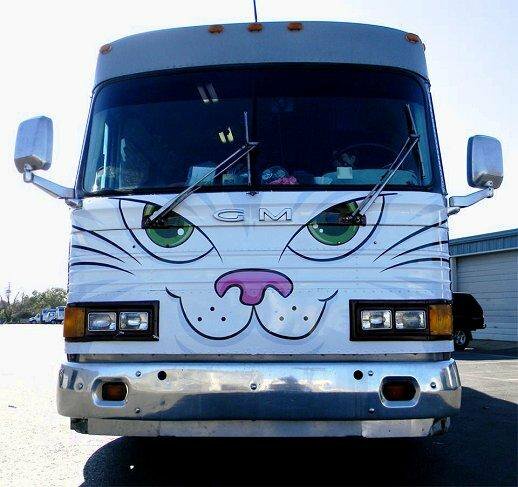 1420 people donated $153,362 on Kickstarter to fund the Acro-Cats tour bus. You can volunteer to help with the show and attend for free. Volunteers are needed to help with everything from merchandise to liter box scooping. More info on how to volunteer is below. Cluck Norris is a chicken who often joins the Acro-Cats on stage. You can see a photo of Cluck here. The Acro-Cats cat circus is a performance where the trainer has the cat performers do tricks for the audience. 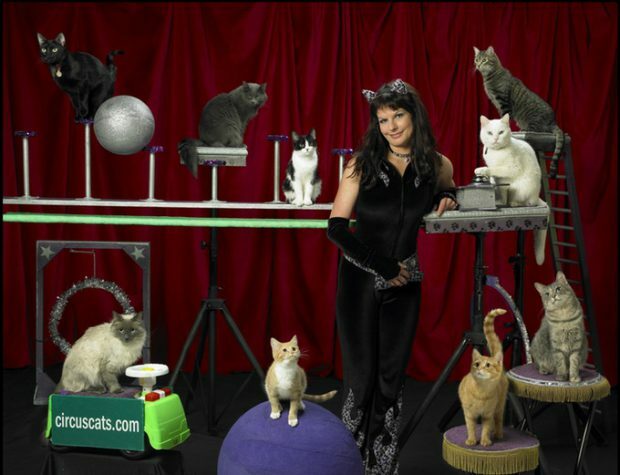 The Acro-Cats troup was founded by Samantha Martin in 2005. Before starting the Acro-Cats, Martin had a rat circus, name Acro-Rats. The Acro-Cats have been touring since 2009. As I was writing this blog post, I was wondering if this is safe for the cats? The Ringling Brother Circus stopped using elephants in 2016 after public concern for the welfare of the animals. I found no statements about Acro-Cats or circus cats on the PETA website. The Acro-Cats website has many posts about adopting cats and partners with animal welfare organizations as they travel across the country. According to the Facebook event for Acro-Cats in Pittsburgh, the local partner is the Humane Animal Rescue League (This is the new name for the Humane Society and the Animal Rescue League, which merged last year). Facebook Event for the Acro-Cats Pittsburgh performance. Volunteer to help with Acro-Cats in Pittsburgh and attend for free! If you would like to help with some of the behind the scenes setup of the Acro-Cats show, you can sign up to be a volunteer for the show here on this Doodle page. Volunteers will be asked to help with things like merchandise and cat care, which the volunteer FAQ notes includes scooping liter boxes. You can read the entire Acro-Cats volunteer FAQ here. This job opportunity is PURRRFECT for the right candidate. Pay is commensurate with experience. This could be considered full time work for the right person. If you are interested in the position, check out the job description here. Subscribe to the MEWS letter here. Looking for more interesting events in and around Pittsburgh? Check out our Pittsburgh events calendar for lots more concerts, fundraisers, film screenings and more.